Business owners are finding it increasingly difficult to make a livable profit. Many are looking for ways to trim costs without sacrificing product quality and/or customer service. One way to cut some of the fat from the operating budget is by ordering business checks online. Purchasing discounted business checks can lead to a significant annual savings for many companies. 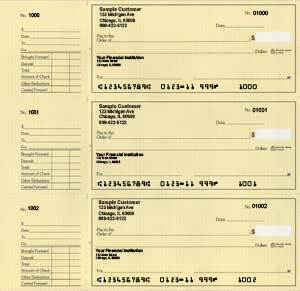 The electronics age has greatly reduced the use of personal checks compared to just a decade ago. However, business checks are still in wide use and remain a notable part of a company's operating expenses. It's an expense that will likely never be able to be eliminated entirely even as technology changes and progresses. Those costs can be reduced in many cases, though, by avoiding purchasing them through the bank. Banks, like any other business, are trying to make a profit. They'll do so in any way possible. This includes retailing their product at higher mark-ups than the average retailer. They may also tack on fees, such as "processing" charges, to ensure that they receive a healthy cut. Purchasing business checks at a local printer can sometimes be slightly cheaper than buying them through the bank. However, many printers simply don't have enough volume to offer prices that are significantly lower than banks offer. Using an online store is often the best way to save money on business checks. Online retailers have the ability to offer deeper discounts than both local printers and the bank because it's all they do. Unlike printers, stationers or the bank, they deal in just one type of product/service. They typically purchase their blanks in massive quantities. This means lower wholesale costs. They can, in turn, pass some of that savings on to customers and still make a profit. The result is lower prices for both business and personal customers. Company owners may be able to save even more money by ordering in larger quantities. Many online stores offer deeper discounts for bulk orders. After all, it doesn't take much more effort to print 500 blanks than to print 100. Ordering two year's worth of product can slash this budget expense by 20 to 50 percent in many cases. Besides saving money, company owners can also save time by ordering business checks online. The first order will require the most effort, but takes about the same time as driving to the bank. New customers must create an account with the online retailer, a process that typically takes less than 5 minutes. They will provide some basic biographical information, plus all of the information that must be printed on each batch. Company owners must also submit a MICR specification sheet, available from his/her local bank. Once this process is complete, the client's information will remain on file with the online retailer. The company owner needs only to log into his account to place subsequent orders. This may be done within minutes from any computer; no driving to the bank is necessary. Shortened delivery time is one additional bonus to ordering business checks through an online retailer. Banks typically take about a week to deliver the finished product. By contrast, many online retailers can process, print and deliver orders in three to four days. Ordering checks online may be one healthy step toward budget-trimming success.